For My hole centers I used clear “Binding Covers” that I bought at Staples, these are essentially thicker versions of transparency paper. Using this material instead meant that I could have some overlap between the bulls-eyes without much trouble. I also marked circles at 24mm 30mm and 57mm as these are either exactly or very close to the most common hole sizes you’ll find in a control panel. 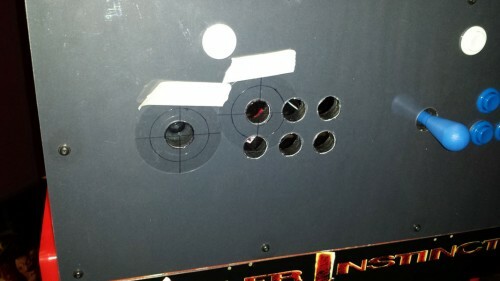 I found the center hole finders are actually extremely accurate and I used a level to ensure that both the machine and the center lines were horizontal for accurate off-set measuring. Here are the dimensions and button positions of the KI2 control panel (should be the same for KI2) Units are in inches, and everything is to the nearest 1/16th. This should be similar for other Midway games from that era. MK4 should be identical except for the placement of the start buttons. War God should be the same. And MK1 MK2 and Wrestlemania should be the same except without the run button. Hopefully others will find this information useful, I know I looked everywhere for dimensions on these control panels to no avail before taking the time to measure them myself. Can you share the ACAD of MK3? is it accurate? I made these in Solidworks, but they were just sketches so the files themselves are useless/incomplete. Dimensionally it’s 100% accurate though. If you want a CAD file it would take all of 5 minutes to simply re-draw it using my dimensions in your software of choice.